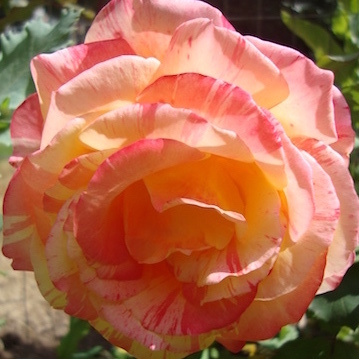 Tropical Sunset Rose (Rosa “Tropical Sunset”) - Facilitates heart-felt communication flowing within yourself and between you, friends, loved-ones, everyone and everything. Helpful getting your energy “out there” and receiving back information to support creating what you want. I AM heartfelt communication circulating within and without. Tropical Sunset Rose is a hybrid tea rose originally breed by a rose grower in New Zealand. This breathtaking rose has radiant and fanciful bright pink and yellow striations that mature to a light pink. The softly fragrant flowers – with notes of citrus, melon and peach – blossom generously, against dense, dark foliage. Use Tropical Sunset Rose Flower Essence when you have challenges communicating from your heart and receiving heart-felt communication from others. Helpful when you have difficulty putting your energy “out there” to create what you want. Everything you encounter gives off an electromagnetic impulse filled with living communication. Clinical studies done by researchers of heart and intuition show that the heart receives this electromagnetic information from the environment first, then within split seconds, sends this information to the brain including parts that relate to expanded consciousness. The energies circulate within you then move back out into the world, in a never-ending communication loop. The inner communication carries a more feminine quality as it circulates around in your body and the external communication has a more masculine quality as it circulates through the outer world. The strongest and most balanced point is where they meet at the heart. This enables you to send and receive heart-felt communication through these electromagnetic pulses whether they are inside of your body or outside in the larger environment. This sounds esoteric but the Tropical Sunset Rose Flower Essence is actually very practical as it helps you to heartfully relate to friends, loved-ones, co-workers, your environment and everything. Tropical Sunset Rose is a key essence in the Manifest Essence Blend because it circulates the intentions and creative energies from your heart out into world and circulates back information to assist the on-going process of manifesting your intention. While the essence was being made, crystals of amber, copper, drusy quartz, green and clear apophyllite, hemimorphite, icosahedron cut quartz, lapis, pink calcite (opaque), pink sapphire, rose quartz and quartz points were placed among the plants with the storage (mother) bottles. Amber aligns the subtle bodies with the physical bodies, transmutes negative energy into positive energy, and emits a sunny and soothing energy that calms and enlivens the disposition. Copper channels and grounds higher vibrational energies into the physical. It conducts and enhances the energies of crystals. Drusy quartz energizes and stabilizes your subtle bodies. Green and clear apophyllite activates the heart chakra and provides forthrightness in decisions of the heart. It facilitates connecting both with the energies of nature and of the other dimension and grounds the communication with them into physical action. Hemimorphite activates your inner light, enlightens the emotional energy fields, facilitates communication and builds bridges between hearts. Icosahedron cut quartz has 20 (5X4) equilateral sides. It is a bridge between the 5th Dimension - the entry into the unified Spiritual realms - and the 4 cardinal directions (N, S, E, W) on Earth. Lapis is a powerful thought organizer. It provides objectivity and mental clarity while releasing emotions. Pink calcite (opaque) enhances connection with the mind of the heart. It strengthens and stabilizes your heart’s energy field and supports being more perceptive of everything it touches. Pink Sapphire brings the heart and mind into coherence and balance with each other. It teaches the joy of interacting with others in a loving way. Rose quartz encourages gentleness, emotional healing, and uniting with the Divine, it shifts your body from a stress-based physiology to a higher frequency Love-based physiology. Quartz points open and clear all chakras and energy pathways, and clear and expand the energy fields. Quartz points and drusy quartz crystals defined the boundary of the energy field for making the Tropical Sunset Rose essence. The actions of the crystals inform the way this flower essence seats into the physical body. While the Tropical Sunset Rose essence was being made the sounds rattle and spirit song coming through Diana’s voice were imprinted into it.